We suggest that before you apply to the Rome Festival Concerto Competition, you apply first to the Rome Festival Orchestra. If a pianist, you should apply first to the Rome Festival Chamber Music Institute for Pianists. After you are invited, you may inquire from us whether we think you have a chance of winning a prize in the Rome Festival Concerto Competition. If we believe that you have a chance of winning a prize, we will encourage you to apply to the Concerto Competition. You will perform as a featured artist in two or three chamber music performances. As a member of the Rome Festival Orchestral you will perform four or five symphony concerts, a fully staged opera, and fully staged ballets. You will visit the cultural treasures of Rome to learn how they inspired composers. You will meet conductors, instrumentalists, singers, and ballet dancers from all over the United States, Italy, and at least nine other countries. Through these artists you will network worldwide for your professional future. You can join Yahoo for free. You will perform as a featured artist in two or three performances, you will perform instrumental and vocal chamber music, you may perform ballet or orchestral repertoire. You will also visit the cultural treasure of Rome to learn how they inspired composers. You will meet conductors, instrumentalists, singers, and ballet dancers from all over the United States, Italy, and at least nine other countries. Through these artists you will network worldwide for your professional future. The Concerto Competition of the Rome Festival is open to all soloists who play orchestral or keyboard instruments. All winners perform as featured solo artists at the Rome Festival in Italy while attending the Summer Institute. The Musical Director may select any First Prize winner to perform as a soloist with the Rome Festival Orchestra. First Prize winners receive scholarships of $3,000. For additional financial assistance the Rome Festival as an educational charity has the authorization of the Federal Internal Revenue Service of raising additional donations and grants for the winners. To apply, a soloist, who must be over the age of 21 at the time of his application, submits the application, $49 application fee, and audio or video cassette tape (two concerti from different historic periods accompanied by piano or orchestra plus one chamber music work) to our USA address: Rome Festival Concerto Competition, Empire State Building, Suite 59th Floor, New York, NY, 10118. 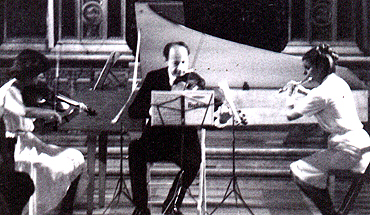 Winners who have attended the Summer Institute of the Rome Festival Orchestra between 1971 and the present have described how the Summer Institute benefitted them. In newspaper articles, letters, seminars, and conversations they have said that, while their experiences were different from what they had expected, the Summer Institute provided them with rich and rare opportunities for cultural, career, and artistic development. The winners enjoyed living in the historic center of Rome, Italy, where they found inspiration walking through the same piazzas, cathedrals, and palaces visited by the great composers. Most liked performing in Rome, a cradle and center of Western culture, where the audiences responded so strongly to their musical ideas. Many appreciated the rigorous challenge of surviving both in a different culture and in a highly intensive performance schedule.